Wow! 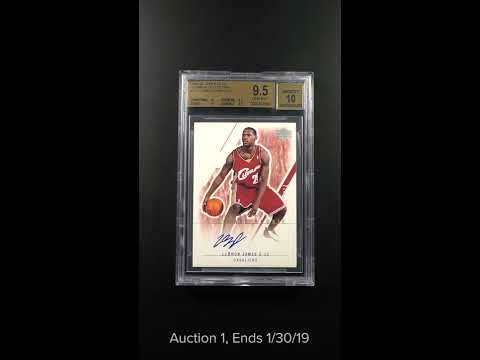 When you think of holy grail type LeBron James rookie cards, the '03 Ultimate Collection Autographed card always comes to mind. A rather simple approach to ultra modern day rookie cards, yet timeless in beauty, rarity and popularity. The offered Beckett 9.5 is particularly special as it's just a whisker away from the overall '10' designation and ranks among the hobby's finest copies. Completely uncirculated with four razor sharp edges, 50-50 centering and dagger sharp corners. The surfaces are seemingly worthy of the '10' sub-grade with zero visual scuffs, scratches or indents present. The autograph is undeniably pristine and boldly struck in blue ink. LeBron was among the most praised high-school phenoms in history and was the #1 overall draft pick in 2003. James has dominated throughout his entire career and is widely considered one of the greatest Basketball players of all-time. In fact, James will pass Michael Jordan on the all-time scoring list upon his return to play. With demand for this card far exceeding supply we feel that the return on investment will be extraordinary. A premium blue-chip commodity which comes highly recommended by PWCC. One of over 15,000 cards, lots, and sets up for bid in our 2nd Auction of 2019. Click on the link above to view the other PWCC auction lots. The PWCC Vault is now live! Open a PWCC Vault account and receive a custom Vault shipping address. Purchases shipped to the Vault receive free shipping and reflect Oregon's 0% sales tax rate.